Our British Actors You Should Know series rolls on this week by profiling an actor that a lot of you will be at least passingly familiar with – because he’s in Sherlock, and we know how much everyone loves Sherlock. (With good reason!) But, how much do you know about the cast that’s bringing Sir Arthur Conan Doyle’s stories into the modern age? Since we’ve already covered leads Benedict Cumberbatch and Martin Freeman in this series, it seems only fair to make our way through the rest of the 221b Baker Street gang as we can. 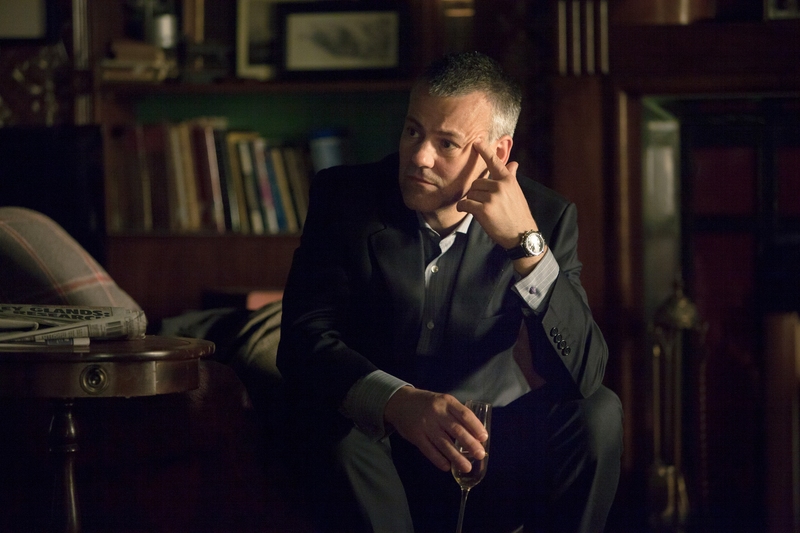 Up this week: Rupert Graves, an exceptionally talented actor who’s been working steadily in British film and television for over 25 years, so you’ve probably seen him in a lot of things already. You may just not have known you have. Read on for some Graves-themed viewing suggestions and let us know what we’ve left off the list in the comments! Different for Girls. Graves stars opposite Steven Mackintosh in this 1996 comedy about two friends who were best mates at school in the seventies. When they meet again in present day London, a lot’s changed – Karl (Mackintosh) is now Kim, a postoperative transsexual who has no desire to stir up the past. Prentice (Graves) is a bike messenger who’s more than a bit lost and stuck in a dead in job. Oddly enough – and to the surprise of them both – romance happens. This film is sincerely charming, and surprisingly thoughtful, if a tiny bit dated at this point. Plus, Graves is pretty adorable in it. In case you were curious. The Forsyte Saga. This period drama chronicles the lives of three generations of the Forsyte family from the 1870s to the 1920s, through the scandals and mistakes of its patriarch, Soames. The story is fairly complicated but there are unfortunate affairs, free-spirited relations, people forced to marry for love, jealousy, obsession, and all the other ingredients of a good old-fashioned (albeit extremely well dressed) soap opera. Graves plays Young Jolyon Forsyte, a free-thinking painter who finds himself involved with several different women, one of whom was the wife of his cousin Soames, and estranged from his family for a time. Drama! It also stars Homeland’s Damian Lewis, Gina McKee, Ioan Gruffudd, Amanda Root, John Carlisle, Barbara Flynn and more. Garrow’s Law. A legal drama inspired by the true life story of pioneering barrister William Garrow, this series is based on real legal cases from the 18th century, as recorded in the Old Bailey Proceedings. Andrew Buchan plays Garrow, and is joined by Alun Armstrong as Garrow’s associate John Southouse and Lyndsey Marshall as Lady Sarah Hill, an aristocratic figure with an interest in justice and the law. Graves plays Sarah’s husband, Sir Arthur Hill, an important politician and member of the government. He also accuses Sarah of being unfaithful to him and goes kind of crazy with jealousy trying to ruin Garrow. It’s pretty dramatic. A Room with a View. This 1985 Merchant and Ivory film adapted the famous E.M. Forster novel of the same name, following the story of a young woman in the restrictive Edwardian culture of turn-of-the-century England and her love for a free-spirited young man. It features a positive festival of outstanding British actors, including Helena Bonham Carter, Dame Maggie Smith, Julian Sands, Dame Judi Dench, Daniel Day-Lewis, Simon Callow and more. Graves plays Freddie Honeychurch, brother to main character Lucy and this is his earliest role (which got him no small bit of attention in the UK at the time, as debuts go). Scott & Bailey. A crime drama that focuses on two female detectives in the fictional Manchester Major Incident Team and the cases they solve, Scott and Bailey has proven quite a hit for ITV. Graves starred opposite Surrane Jones and Lesley Sharp during the show’s first season as Nick Savage, the ex-boyfriend of Sharp’s Rachel Bailey. A married barrister, Savage is nevertheless a serial womanizer and generally not-very-nice person. It’s a bit weird watching Graves – who largely thanks to Sherlock I generally viewed as an uber nice guy – play a character with so few redeeming qualities, but it’s a fun role for him for sure. Sherlock. Many of you are probably aware of Graves because of his role in the BBC’s popular Sherlock series, but just in case you haven’t for some reason, consider this your reminder to make your life better by checking it out immediately. Graves plays Detective Inspector Greg Lestrade in this modern day retelling of Sir Arthur Conan Doyle’s Sherlock Holmes stories, the head of New Scotland Yard and general connoisseur of the services of the world’s only consulting detective. Stars Benedict Cumberbatch and Martin Freeman tend to steal a lot of the thunder surrounding this show – which seems mostly fair as they do play Holmes and Watson - but Graves’ performance is also fantastic and he has great chemistry with both leads. V for Vendetta. A adaptation of Alan Moore’s famous graphic novel by the Wachowski brothers – otherwise known as the guys who made The Matrix – that tends to get rolled out again on television every year around November 5, V for Vendetta takes place in a totalitarian England following a war which changed the face of the planet. In a world without political freedom, personal freedom or, really, much faith in anything, comes a man in a porcelain mask who fights terrorism through seemingly absurd acts and has an obsession with the letter B. Hugo Weaving and Natalie Portman star. Graves plays Dominic Stone, lieutenant to lead inspector Finch, and a man who loves his country. The role isn’t a huge one, but becomes quite important at the end of the movie. Wallander. Starring the great Sir Kenneth Branagh, Wallander follows the story of a tortured (and frequently depressed) police officer who attempts to solve grisly murders while his personal life disintegrates around him. Graves pops up in The Man Who Smiled, the second episode of the dark Swedish mystery series’ second season, playing the wealthy head of a charitable foundation who does a lot of work in Africa. There’s a twist to this character – it’s a pretty great role for Graves – but I can’t tell you what it is. The White Queen. This ten-part drama adapts several of the novels from author Philippa Gregory’s Cousins War series about the Wars of the Roses and is jam packed with British acting talent. It’s also a lot more fun to watch than you might expect, once you realize this is also a series that is completely okay with the assertion that a former Queen of England might also have been a witch. At any rate, the British dynastic drama is super entertaining. Graves plays Lord Thomas Stanley, an English noble who ultimately ends up married to Margaret Beaufort (played by Amanda Hale), the mother of the boy who grows up to be King Henry VII. Stanley is an opportunistic, weasly kind of character who’s always looking out for his own self interest and, as such, the role is great fun for Graves. Plus, you know, there are swords and things. Honorable Mention: Doctor Who. In a tale of fandoms colliding, Graves actually appeared on the iconic sci-fi series during Series 7, in an episode called Dinosaurs on a Spaceship. (The title is basically the plot of the episode, really.) Graves plays an Edwardian big game hunter named John Riddell who joins an adventure with the Doctor, his companions Amy and Rory Pond, and Queen Nefertiti from ancient Egypt wherein they battle David Bradley’s evil black market trader Solomon. It’s kind of utterly ridiculous, but also silly fun. Allright folks - tell me, what'd I miss? What's your favorite Graves role? What performance should be on this list and isn't? Let us know in the comments!